January 25th witnessed the presentation of the Movistar Team at Telefónica , they will continue to work together in 2017. The Movistar Team intends to continue its run of last year, in which it managed to be on the podium of the main cycling competitions, The Giro, the Tour de France and the Tour of Spain. The presentation event was the ideal occasion to uncover an initiative that emerges from the power of the LUCA data scientists. They were able to use the data generated from their 2016 performance to plan the strategy, improve performance and make better decisions in face of the new season. Since announcing the use of Big with cycling, we have seen a big impact with the media generating articles in Europe Press, Bloomberg and El País. 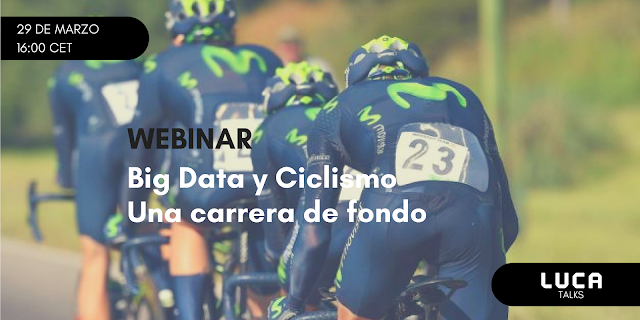 At the LUCA team we want our Data Scientist Pedro de Alarcón to work in collaboration with Mikel Zabala the Team Movistar coach and tell us how data is obtained, visualized and all the potential they can add to sports, this time obviously focusing on cycling. Are you interested in both sport and Big Data? Don't miss out on our next webinar on Wednesday the 29th of March at 16:00 CET, don't be shy and have some questions prepared so you can be enlightened by our experts.